Motivated by a sudden and unexpected tragedy born of messing around with a Ouija Board app, Sophie heads off to the moody, weather-beaten Isle of Skye to stay with the kind-of-cousins she met once and only once when she was a small child. 16 year old Cameron is a broody musical prodigy with a hand injury that prevents him from achieving greatness. 15 year old Piper is perfect- the sweetly smiling hostess who seems too good to be true. 7 year old Lilias is strange and once tried to cut her own skeleton out. Rebecca is dead and has been for 7 years. Their father, Sophie’s kind of Uncle James, is either the most gormlessly absent parent in the world, the most wilfully ignorant, or he genuinely doesn’t care what’s going on in the lives of his weird offspring. Rebecca is the one that started it all- the spirit that Sophie tried to summon, the probable reason for the tragedy, the reason Sophie is on Skye. All Sophie knows is that her kind-of cousin died in an accident at her family’s home. So it turns out that the Skye house has a tragic and accident-prone history and that strange things have happened there for a long time. Rebecca was acting oddly before she died, and the family seem very reluctant to talk about her, or any of the similarly odd behaviour exhibited by Lilias. Intrigued, and a bit afraid, Sophie is determined to get to the bottom of the mystery surrounding Rebecca’s death, as she is convinced it connects with a death in her own life. The novel lays its cards on the table pretty early- there is a ghost, level of malice unknown, let’s see what she wants, and there are creepy dolls that whisper to the children. Lilias claims they tell her to do bad things, even when she doesn’t want to. Each chapter begins with 4 lines from the Frozen Charlotte ballad, a poem that inspired the production of the dolls and a tune that threads the most chilling parts of the story together. The book was vaguely atmospheric, aided mostly by the wind and Dark Tom, the shrieking parrot. Personally I found the writing basic to the point that it felt robotic- I guess I wanted more emotion, more menace, more sensation. I felt like Sophie was just running a bit of commentary on what was happening, not feeling much of any of it. I did like the psychological warfare that Cameron and Piper were engaged in- each one is determined to paint the other as the villain of the piece by dropping carefully chosen facts and suggestions out of context. Not sure of the full stories, at the mercy of the information drip fed to her, Sophie becomes less and less sure who’s telling the truth, who she can trust and which of the three cousins is the most dangerous. Also, if you live in a house that was a school over 100 years ago, why on Earth would you keep the school’s stage in your living room? Why would the blackboards still be up? If you’ve got one kid that wandered off into the frosty night and died, why would you not keep a better eye on your remaining 3? Maybe check once in a while that they’ve not deteriorated into some sort of psychotic fog? Why don’t people trust their own eyes? 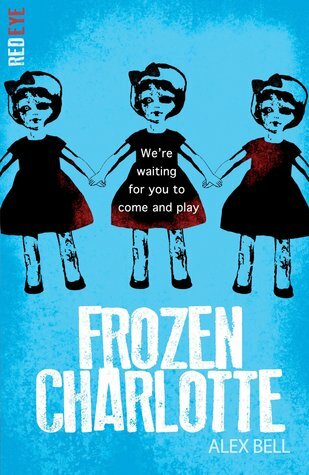 Frozen Charlotte was an easy enough read with the occasional spooky moment, but for me it lacked atmosphere and suspense. I found Sophie to be a bit of a limp protagonist and after how much I had enjoyed Fir, also in the Red Eye series, I think I had very high expectations for Frozen Charlotte that just weren’t met. Kids are always asking me for horror books, and the China Doll trope is very well known, so I don't think it will lack readers, this one just didn't do anything for me.